I recently started looking into mining Burstcoin and found a few things about the process were difficult to get information on and in general weren't explained clearly. Mining in a pool was one of those things. It's not as simple as just starting up your miner in pool mode, you have to do more. The extra thing you have to do when mining in a pool is set the "Reward Recipient". This action costs 1 coin. What it does is tells the Burst network which Burst address (wallet) should receive the block you have successfully mined. Since pools typically have a 60/40 split system, every block you mine while in a pool will get you a 60% reward, so by setting the recipient makes sure that the pool receives and correctly distributes your share of coins. To set the recipient is not straight forward because there is no button for it in your wallet. You have to go to a specific web address to do it. Setting the recipient is done from any running Burst Wallet server however. If you are running the local wallet, your Burst Wallet address is http://127.0.0.1:8125/index.html and your Reward Recipient address is http://127.0.0.1:8125/rewardassignment.html. Simply change 'index.html' to 'rewardassignment.html'. This will work for any other online Burst Wallet too. It doesn't matter whether you use your local wallet or an online wallet to set the recipient, the end result is the same. This is the actual page itself. You do not need to worry about the first two inputs here, the last section of the page is what you're after. The passphrase is the passphrase for your own Burst Wallet. The Recipient is the Burst Wallet address for the pool. Typically the pool info page will provide this address at the top of the page. To confirm that the transaction went through, go to your wallet and check your latest transactions. 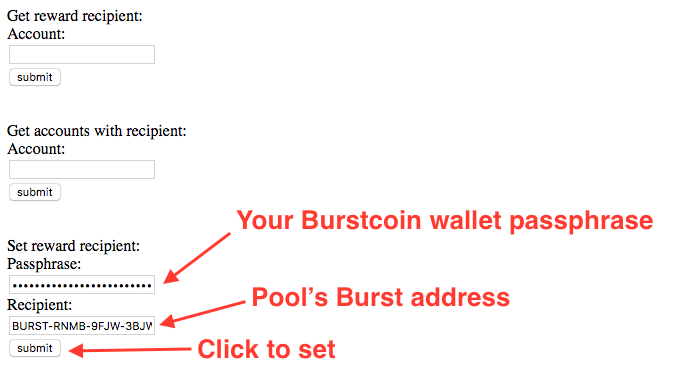 You should see a "Reward Recipient Assignment" transaction with the account of the Pool's Burst address. Depending on pool rules, you may have to wait a certain amount of time after setting the recipient before you can start mining. The chances are you can start right away since you're not likely to actually mine anything right at the beginning anyway. If you are mining in a pool, you may find this article intersting - Twelve elements of the Burst Mining Pool interface explained.